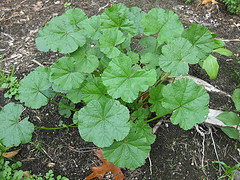 Sochal is a wild vegetable found anywhere on the road sides, parks, playgrounds, grazing lands etc. It can also be grown in our kitchen gardens easily. Tastes fabulous after cooking. 75o g sochal leaves (mallow leaves). 3 saboot sookhi laal mirchi (red dried whole chillies). 1.5 table spoon laal mirch powder (red chilly powder). 1 medium size pyaaz (onion). 3-4 ladles of mustard oil. Clean sochal leaves, wash 3-4 hours before cooking to drain off the water, peel off the nadir, cut into round chips, wash and keep aside. Cut and wash onion. Fry onions till brown and turn the stove on low flame, put mirchi powder and stir till dark red colours appears. Add salt, hing, ginger powder, stir and add sochal leaves and stir gently so that oil and other contents mix with the leaves evenly. As soon as sap of the leaves start coming out add fried nadir and saboot mirchi.